Hey, Kids! Try Some Candy Tobacco! 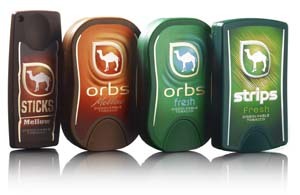 R.J. Reynolds Tobacco began selling Camel Orbs, Camel Sticks and Camel Strips earlier this year. — Lance Hernandez, “Health Experts Alarmed By ‘Candy Like’ Tobacco Products: R.J. Reynolds Test Marketing Orbs, Strips, Sticks In Denver,” ABC 7 News, Denver, 24 May 2011. I suppose it was inevitable. To entice children to try their product, cigarette companies have used cartoon characters (Joe Camel) and hip accessories (Marlboro Gear). Why not take the next logical step and disguise nicotine as candy? One wonders why they’ve waited so long to do this. R.J.Reynolds company spokesperson alleges that no, of course they wouldn’t market their product to children. However, these “dissolvables” look and taste like candy — specifically, like chocolate mint. They come in attractive packages that can be easily hidden in a shirt pocket. Which, of course, is precisely the idea. Children can get hooked on these candy-flavored tobacco sticks, and easily conceal the package. Clever. And, of course, vital for the industry. If it hooks a smoker at a young age, then a tobacco company can sell so much more of its product — until, of course, the smoker dies. But death takes years! And young people tend to be more susceptible to marketing. So… tobacco companies have long tried to lure the young user. It’s good for business. Well, not until R.J. Reynolds finds a way to market a delicious, sweet toilet-bowl-cleanser drink. And, given the company’s new candy-flavored nicotine, I wouldn’t put anything past them. In talking with my doctor, it’s not the nicotine that is dangerous, though addicting. Its the other toxins and particulates in the smoke that come with it. This might be a valuable aid to those who want to quit. Just thinking outloud. “The product, which KDHE said is showing up in convenience stores across Kansas, could cause dangerous nicotine poisoning in small children who mistake the sticks for candy, the agency said. The estimated minimal lethal pediatric dose of nicotine is 1 mg. per 2.2 pounds of body weight. The ingestion of 1 mg. of nicotine can induce nausea and vomiting in a small child. In response to Irene’s thoughts…. This question comes up frequently! It’s true that certain nicotine replacement therapy (NRT) products can be very effective in helping people quit tobacco. However, NRT products are created and marketed with that intention. The products that are discussed here are not intended to be quit aids but instead are marketed as a temporary form of nicotine for smokers in settings where smoking is banned. Unfortunately, these products may actually decrease cessation rates as smokers use these products in smoke-free areas instead of being encouraged to quit tobacco. Hopefully this information is helpful!